Jill Skinner began her career with Dumont Printing as a courier in 1999, developing a love for printing and the people she works with. Her positive attitude, sunny disposition, knowledge of printing, and excellent communication skills consistently earned high praise from clients as their ambassador from Dumont Printing, and in 2007 she joined the sales department. Born in Fresno, California, Jill was raised in the nearby mountains. 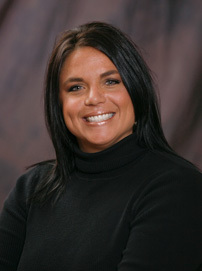 After graduating from Sierra High School in 1995 she attended Fresno City College, where she distinguished herself on the soccer team. She says her nine-year-old daughter Nicole is full of life, keeping her on her toes and laughing every day. In addition to playing soccer for twenty-four years, Jill has coached Nicole’s soccer team for the last three years. She confesses to being a “soccer mom,” but doesn’t drive a minivan – not yet, anyway. Given a choice, Jill would rather be outside working in the yard or spending quality time with friends or family. She also enjoys traveling, meeting new people, and shopping – she always has her eyes on a new pair of shoes!